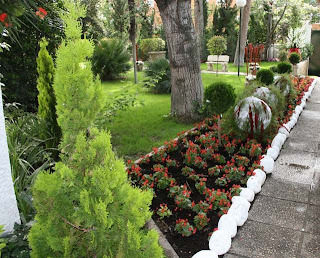 Everyone dreams of having a beautiful garden, a place of entertainment that combines all forms and colors in a harmonious way is a delight for the senses. Nature lovers appreciate the green environment for their energizing and renewing power, in fact our body needs as part of its vital engine regular contact with natural environments. All this is possible if you have the space, time and desire to create a beautiful recreation area, as mentioned there are no magic recipes always just work, dedication and patience are able to achieve wonderful results. Here are important points that creating these opportunities for personal and family enjoyment. First we plan our gardens, build a project that combines the harmony and beauty within the scope of work and time they can give. Try to implement in your own garden stamp a mark of distinction that set him apart from the rest but never forget if you see good ideas in other gardens the possibility of implementing them in the condition that you do not neglect aesthetics. A garden with straight lines unless they have a large space is not usually the best approach. In fact, the wavy lines often make small spaces seem much broader than they really are. Your garden must be comfortable as long as it is used, and for the care and maintenance of it. Select species that require little maintenance work but do not skimp on beauty, it will save you much time to spend in other areas of green space. You can place grass in your garden, the grass is no doubt that more work will, but having a perfectly level field, building a good drainage and place a good quality seed or sod can save a lot of work in the future. If you have too much shade in your garden you can choose instead of turfgrass species that tolerate more easily the low sun and the Ivy, Periwinkle, Pachysandra, or Dichondra. Place plants in hanging baskets they do not occupy space on the ground and give a colorful, beware that if you overload your garden, all that place has to maintain harmony with space. If you have small ravines in the garden think of building stone walls and balconies, embellish a lot and are also the ideal solution to change the morphology of the soil. Construct paths wide minimum of 1.5 m. allowing you and a walk in complete freedom, it can also decorate them with low-voltage lights are inexpensive and easy to install. It would be nice to think if he can put a small fish pond or an artificial source, you will find various offers of Designer Garden Lights at Lightingstyles.co.uk and the glowing of exotic garden lamp to create a special atmosphere. If banks put in your garden, opt for wood or concrete or stone, wood produces a very beautiful color scheme although other materials may also produce beneficial effects. If they may be surrounded by vegetation, the touch is very important and adds extra plus for relaxation. If you have children at home, a wooden sandbox for your garden would be nice, would integrate the smallest in that beautiful space that I believe in, and the fun can keep a good time. When designing gardens, plants are thoughtfully chosen to provide necessary color, shape and form. Creating a Beautiful Garden is a process that shouldn't be rushed. You can use your garden for so much more than just growing flowers, even if they are beautiful. Place plants in hanging baskets they do not occupy space on the ground and give a colorful. Growing your own produce can definitely be a fun and satisfying experience, especially when you harvest the vegetables. Thanks a lot.